If you love it as much as we do, you may not want to even ask the obvious question: Is pasta bad for you? The answer may surprise you. Studies also show pasta consumption is linked with a reduced risk of cardiovascular disease, obesity, diabetes, and metabolic syndrome. Pasta is one of the most beloved comfort foods on the planet, and the leading market, perhaps not surprisingly, is the United States. The average American eats nearly 20 pounds of pasta every year—which amounts to 2.7 million tons consumed annually in the U.S., according to the International Pasta Organization. We prepare pasta in myriad and delicious ways: hot, cold, covered in tomato sauce or cream, tossed with meat, poultry, veggies, or seafood, or with just a pat of butter and some garlic. But as good as it is for your taste buds (and for your soul! ), is pasta bad for you in terms of health? The answer is complicated. A bit of history first: The exact origins of pasta are difficult to trace, but we do know that it originated thousands of years ago in central Asia, where it was made from various plant-based flours. The process traveled westward and was further refined once it reached the Mediterranean, where durum wheat became the main ingredient in pasta flour, and where pasta was mixed with fresh vegetables and herbs. Early Spanish settlers brought pasta to America but it didn’t become popular until Thomas Jefferson tried it during an extended trip to Paris between 1784 and 1789 and then, upon returning home, sang its praises. When large groups of Italian immigrants relocated to the U.S. in the late 19th century, pasta became even more in demand. Fact: Not only does pasta contain complex carbs that help give you energy, but many varieties are enriched with essential vitamins and minerals. Fact: One serving of pasta contains only around 200 calories and one gram of fat, and its low glycemic index can help you control your appetite. Fact: There is no genetically modified wheat or wheat products that are commercially grown or sold in North America. Looking at these stats, there are both pros and cons. On one hand, pasta is low in fat, sodium, and calories, high in protein, free of cholesterol, and enriched with vitamins and minerals. On the other hand, it’s high in carbohydrates and contains only a moderate amount of fiber. So, what does this mean? Is pasta bad for you? Here’s some more good news to share with anyone who asks, “Is pasta bad for you?” Studies show pasta consumption is linked with a reduced risk of cardiovascular disease, obesity, diabetes, and metabolic syndrome. A number of factors come into play. When pasta is cooked and cooled, for example, it becomes a resistant starch, which is not broken down by digestive enzymes. Resistant starch increases fat burning and reduces the fat storage of fat cells, suggesting it may help with weight loss. There are 600 different shapes of pasta produced around the world, according to the International Pasta Organization. You’ve probably already guessed that Italy is the country that eats the most pasta worldwide, but did you know that Tunisia and Venezuela are #2 and #3 on the list? According to a recent survey, Americans rank spaghetti as their favorite pasta, followed by penne and rotini. Stick to the serving size. A healthy serving size of pasta will vary, depending on the size and type of noodle. But, in general, it’s only between one and one-half of a cup (before cooking), which is a lot less than what most people eat during one meal. Measure your pasta before cooking and stick to smaller portions at lunch time and a slightly larger portion at dinner. Cook your pasta “al dente” (firm). Besides providing a superior texture and flavor, cooking your pasta “al dente”—which means “to the tooth” in Italian—has a lower glycemic index than pasta that is cooked longer for a softer texture, according to LiveStrong.com. Foods with a lower glycemic index are healthier for diabetics and those seeking better blood sugar control. Choose healthy sauces and toppings. Instead of topping your pasta with cream- or butter-based sauces, loads of cheese, and fatty meats, try healthier choices like olive oil, assorted vegetables, lean protein, red pepper flakes, herbs, onions, and garlic. If you’re craving a sauce to top your pasta, avoid jarred sauces that often contain additional sugar, fat, calories, and preservatives. Try an alternative pasta. These days, one trip to your local grocery store will reveal a variety of alternative pasta made with whole wheat, legumes, brown rice, buckwheat, or quinoa. 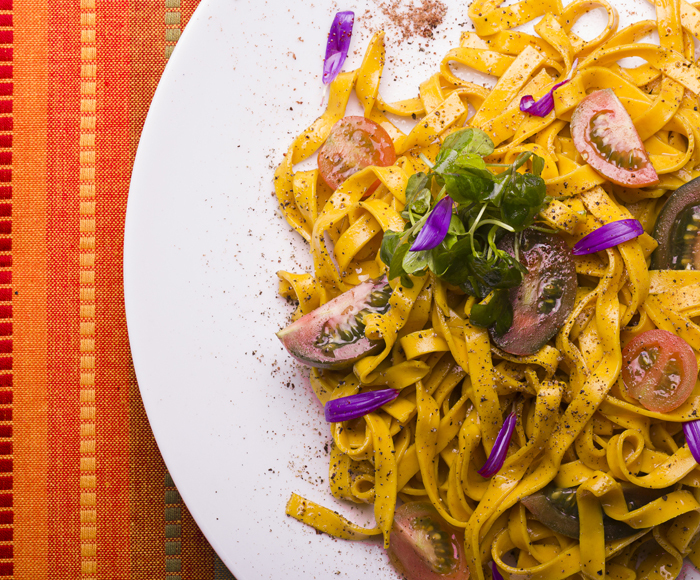 Alternative pastas often have more fiber and protein and fewer carbohydrates than durum wheat pasta. Some types are also suitable for those with celiac disease or gluten sensitivity. Pasta is a key component of many of the world’s traditional healthy eating patterns, such as the scientifically proven Mediterranean Diet. 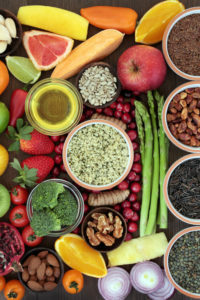 Most plant-based dietary patterns help prevent and slow progression of major chronic disease and confer great health benefit than current Western dietary patterns. At a time when obesity and diabetes have a high prevalence around the world, pasta meals and other low-Glycemic Index foods may help control blood sugar and weight especially in overweight people. Click here to see the full list of pasta benefits. 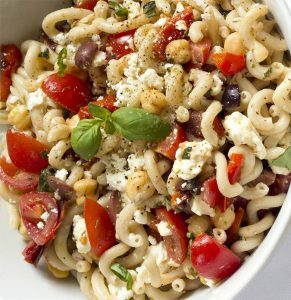 This gluten-free pasta salad can be made ahead. Ingredients can be cut up the day before eating. The pasta can be cooked, cooled and stored in a large bowl, covered with plastic wrap. The dressing can be made ahead and stored at room temperature until served. Bring 4 quarts of water to a boil in a large pot. Stir in 1 teaspoon salt and add pasta. Follow package instructions except undercook pasta by 2 to 3 minutes or until it’s opaque but firm. Rinse in cold water and drain well. Toss with 1 tablespoon olive oil. Return to pot. Add tomatoes, chickpeas, red peppers, feta cheese (if using), Kalamata olives, 1 tablespoon basil, and thyme to drained pasta, tossing to combine. To make dressing, place ¼ cup olive oil, vinegar, garlic, 2 teaspoons basil, oregano, and sugar in a medium bowl and whisk to combine. Drizzle dressing over pasta, tossing gently until ingredients are evenly coated. Taste before adding salt and pepper, as feta and olives are salty. Transfer pasta salad to a serving bowl and chill 1 to 2 hours. Alternatively, serve at room temperature. Leftover salad will keep 1 day in the refrigerator. Each serving with dressing contains 381 calories 18g total fat, 6g saturated fat, 0g trans fat, 17mg cholesterol, 799mg sodium, 43g carbohydrate, 7g fiber, 5g sugars, 11g protein, 22Est GL. add, appetite, blood sugar, blood sugar control, calories, cardiovascular, cardiovascular disease, celiac, celiac disease, cholesterol, control blood sugar, cooking, dairy, diabetes, diabetics, diet, digestive, digestive enzymes, fiber, food, garlic, gluten, gluten free, gluten free and, gluten free and more, gluten free pasta, gluten sensitivity, Glycemic index, health, healthy diet, healthy eating, healthy eating patterns, iron, Lose Weight, low glycemic index, low glycemic index foods, lower glycemic index, mediterranean diet, metabolic syndrome, niacin, nutritional value, obesity, obesity and diabetes, obesity diabetes, portion sizes, preservatives, protein, quinoa, serving size, studies show, sugar, thyme, trans fat, vegetables, vitamins, vitamins and minerals, wheat products, whole wheat, wine. I thought you might be interested in this article on https://universityhealthnews.com: Is Pasta Bad for You?